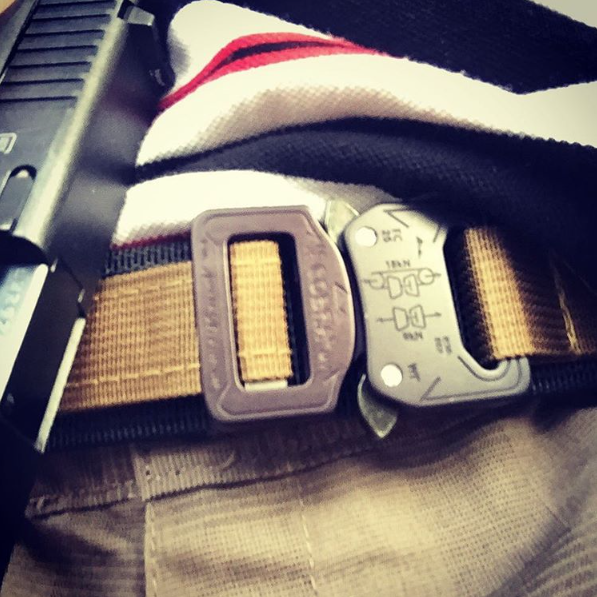 Nylon tactical belts for everyday carry are no longer just a new fad, but a legitimate and practical material to keep your firearm where it's supposed to be, while on your waist. A while back I wrote an article titled Have You Made The Switch To a Nylon Gun Belt, where I presented the benefits of a reinforced nylon belt for everyday carry. In that article, I highlighted a company by the name of Liberty Gun Belts that I found to be producing top quality products at a great price. Since then I have come across many other companies making similar belts, but haven't found any that I liked more. However, I was recently contacted by Mike Davis, the owner of Red Republic Tactical, who asked if I'd be willing to evaluate their nylon everyday carry belt. So, I wanted to give it a fair evaluation and see how it stacked up to the one I had been wearing every day. Like I presented in the previous article, the benefits of a quality nylon tactical belt are abundant. But, I'm sure you're asking yourself: Aren't all belts the same? Well in many ways, yes, but the differences really come down to the quality of materials, workmanship, customer service, and price point. Let me ask you a question: What makes you buy one product when the other brand is almost identical? Most likely it is the factors mentioned above that drive your selection. In fact, sometimes we may even pay a little more to ensure we have the best quality. So whenever I do any of my reviews, these are important factors to me, because I know they are important to you as well. The gun belt I tested this time around is called the Everyday Tactical Gun Belt. The price point is at or below many of the comparable belts on the market, at $70. I do want to say that they also have ones priced lower than this, as well. At the time of this writing, you can order any of their belts in one of four colors (wolf gray, olive drab, coyote tan, and of course black). The Cobra Buckle is quick to fasten and unfasten. Some companies have a lot more variety of colors and patterns to choose from, but if you are like me you would probably stick to one of the more basic colors, even if there were hundreds to choose from. As you can see from the picture, I went with the coyote tan color, which, when combined with the black, looks great. I found the 1.5″ nylon to be extremely good quality and exceptionally firm. Furthermore, all of the stitching was finished really well and I didn't find any loose threads or unfinished edges. Speaking of that stitching, this belt does not have to be trimmed. When you order your belt, you order it based on your waist size. The nylon will be sewn and the edges dressed up so they will not fray. 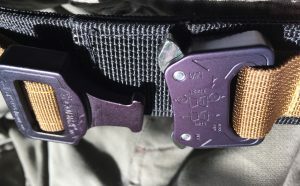 You can then make adjustments easily by loosening or tightening the velcro strap that feeds through the buckle. This will help out after your Thanksgiving smorgasbord. Like many other companies making nylon belts, Red Republic Tactical uses the ‘Cobra' belt buckle. As you can see in the pictures, the Cobra belt buckle is very streamlined, so it adds no bulk. Additionally, the buckle is easy to fasten and unfasten by pressing in on two tabs which are on opposite sides of the buckle. Shipping was fast, although there is a high demand for them right now, and the lead time is about 2 weeks. During my time speaking to Mike Davis, I got the impression that he definitely takes pride in his company and wants to make sure the customer is satisfied with the end result. In fact, Mike is currently designing a completely new nylon belt that sounds like it will be very comfortable, and I am excited to see it when it becomes available. Overall, I was very pleased with my tactical belt from this company. I have been wearing it nearly every day for about one month, and I have absolutely no complaints. It definitely passed my quality control test and, even better, the customer service was great. 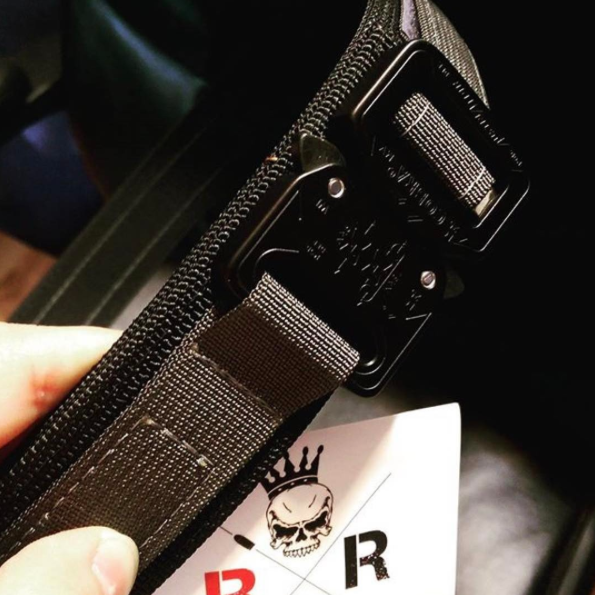 If you have been thinking about transitioning to a nylon gun belt for everyday carry, you won't regret getting one from Red Republic Tactical. What kind of belt do you carry? Is it nylon? Or is it a leather gun belt like you'd find in our store? Let us know in the comments below. Bob, thanks for reaching out and I have to admit, in the review, I never even considered looking at buckling the belt with one hand and if it was possible or not. Since reading your comment, I have tried buckling mine with one hand, and while not impossible it definitely is more difficult. 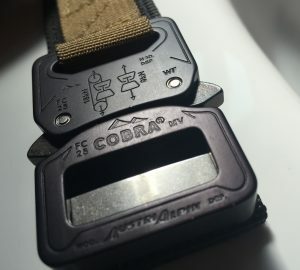 Another option would be to leave the cobra buckle latched and just undo the belt with the running (the side with the velcro) by running it through the buckle. This is definitely much easier one handed. Hope that helps. I saw your first story and bought one of those belts for $65 (?) or right around that. The nylon and velcro has held up well but I ran into a problem the first time I put it on and that is the buckle. The belts are 1.5″ to the T which stretches the limits of sewn 1.5″ pant loops. Therefore, you couldn’t thread the belt thru the loops with the buckle attached and it was easier with the pants off because the velcro strap will hang up at each loop. I don’t know about you but I put my belt on after I put my pants on and it was a pain trying to get all that material thru each loop. Also every time you take the buckle off you can lose the positioning of it and you have to readjust where the buckle fits you best. A leather belt either fits the loops or not and they’re easy to thread thru the loops with your pants on. The biggest challenge with such a stiff belt is if 2 loops are close together it difficult to bend the belt to get the tip thru the next loop but that’s preferable to taking your pants off. I’ve set up my old nylon Liberty belt like a duty belt for shooting steel and have the holster and mag carriers pre-attached then use snap loops to hold the 2 belts together. I wouldn’t recommend the nylon belt for every day wear unless you wear the same pair of pants every day. Hi Doug, Thanks for your comment. I too have found it easier to remove the buckle when threading the belt through the loops on some of my pants. Most of my pants the belt and buckle seem to feed through just fine. I think it comes down to the type of pants. A lot of work pants or construction type pants, maybe cargo style seem to have 1.5″ or 1.75″ belt loops, where jeans and dress pants have a 1.5″ loop and some maybe smaller. I actually don’t mind readjusting the belt each time I change pants because I find it gives me the ability to fine tune the adjustment based on the pants and gun and if I’m tucking my shirt in that day or what not. As opposed to a leather belt that I usually find one hole is a little too loose and one is a little too tight. I totally get your point though and it is not as quick to feed through the loops as a leather belt. Thanks again for the feedback and stay safe!